If you want the simplest, most convenient e-cig (which is the same size as a Mini), consider the cartomizers: the two-part e-cig using an integrated cartridge and atomizer. You just screw on a pre-filled cartomizer and vape. No juice dripping or cart filling required (although you may want to do so to save money – those cartomizers can get expensive). The new advanced cartomizers – Vapor4Life’s Premium and WOW Vapor (i.e., Premium cartos filled with better-tasting e-liquid), VaporNine’s Turbo, CigEasy’s Gold Label Deluxe, and especially BloogPlanet’s MaxX Fusion – are far superior in flavor and, especially, vapor … and IMO are definitely worth the slightly higher cost. And there is now a fat batt for the Kr8 (and 901), the Elegant Easy from CigEasy, discussed in Part V and described in-depth in my review. Because of the greater length of the standard Kr8 battery, its PCC, shown below, is of a different design than most others. It charges one battery and holds two cartomizers. The new, more expensive MaxxFusion Mini PCC (for use with the shorter 65mm batteries) is an advanced, slide-opening design. It charges one battery while also holding a complete assembled e-cig. For more information about the Kr8, read Birdy’s outstanding ECF A VaporKing User Guide and my comparative review, and explore ECF’s KR808D-1 Model Specific Discussion forum. 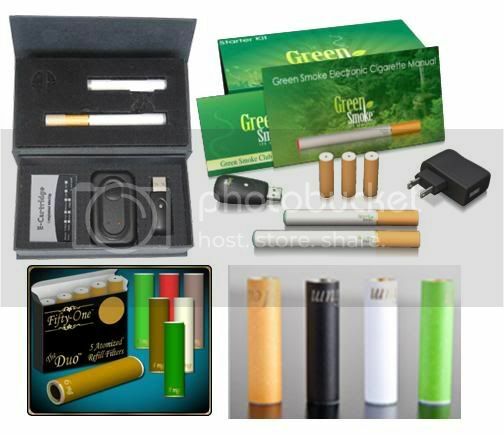 Kr8 suppliers, NHaler and LeCig, also carry the somewhat similar GreenCig, the G220 starter kit for which is $75. The GreenCig cartomizer is longer than the Kr8’s, but the battery is shorter. Total size: slightly shorter. You might want to consider ordering some of the GreenCig cartomizers (which also work well the Kr8 automatic battery, but require an adapter for Kr8 manual batteries) to check it out. Those cartomizers cost about 50% more than Kr8 cartos, but they they hold more e-liquid. They have a tighter draw and very little throat hit, but more vapor and, to me, they have a smoother, more pleasant taste. [The vapor and taste comments are relative to the standard Kr8 cartos, not the advanced ones.] Unlike their country cousins, color choices are limited to black or white … or black and white. Shown below is the $119 deluxe kit, which includes an elegant looking PCC. 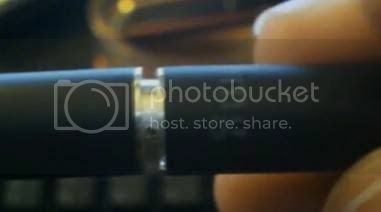 E9 batteries and cartomizers are not compatible with Kr8 parts, although I understand that some of those brands have switched over. It’s confusing.† LeCig carries both the Kr8 (their D1) and the E9 (their D2: cartomizers and batteries). LeCig is the only moderately-priced supplier I know of (NHaler no longer carries the E9), although other companies’ cartomizers are priced competitively with GreenCig carts (and I’ve read good things about Vapure‘s). † Lots of confusion with these cartomizer thingies. It’s ironic, because the devices themselves are so simple to use. Most recently 2-ml capacity Mega cartomizers have been introduced for the eGO/Tornado (which also will work on the Riva) and are being carried by many suppliers of those models. At this point, you may have become excited about one or more models and are chafing at the bit to place an order. But wait! The “best” e-cigs (that is, my three favorites ;)) – as well as many other really good models – are yet to come! Speaking of Kr8 batteries, some of them have 5 second cutoffs, others 10-second. 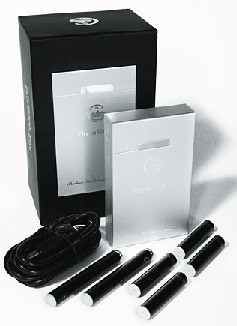 They are available as automatic or manual switch, in three sizes: short (180 mAh, only stocked by Vapor4Life), regular (280-300 mAh), and XL (380mAh). 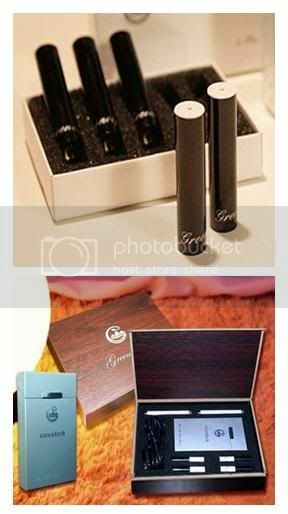 Kr8s are sold by myriad suppliers and under several brand names, including: NHaler (KR808D-1), Vapor4Life (Vapor King), PureSmoker (Ace), CigEasy (Easy), GoodProphets (VapoRite), LeCig (D1), VaporKings* (KR808D-1), Heaven Gifts, and HealthCabin. Those are just the ones I’ve dealt with. For more information about the Kr8, read Birdy’s outstanding ECF A VaporKing User Guide and explore ECF’s KR808D-1 Model Specific Discussion forum. 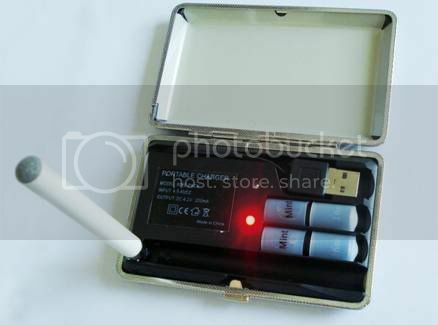 NHaler and LeCig also carry the somewhat similar GreenCig, the starter kit for which is much more expensive (I’m not sure why). The GreenCig cartomizer is longer than the Kr8’s, but the battery is shorter. Total size: slightly shorter. You might want to consider ordering some of the GreenCig cartomizers (which also work well the Kr8 automatic battery, but require an adapter for Kr8 manual batteries) to check it out. Those carts cost about 50% more than Kr9 carts, but they last twice as long. They produce very little throat hit, but much more vapor and, to me, they have a smoother, more pleasant taste. Unlike their country cousins, color choices are limited to black or white … or black and white. Shown at bottom is the very expensive deluxe kit, which includes an elegant looking PCC. The cartomizer model most frequently mass marketed on the Internet and sold in malls is the E9, under such brand names as Green Smoke*, Smoke51 DUO, Vapure, KR808D-2, Red Dragon, Loong Totem, Bloog, and ePuffer. The E9 cartomizer is the same size as the Kr8; it normally is sold with a shorter battery. Leaford ranks this device #1, because of its unparalleled vapor production, while acknowledging its diminished flavor and throat hit. E9 batteries and cartomizers are not compatible with Kr8 parts, although I understand that some of those brands have switched over. It’s confusing.† LeCig carries both the Kr8 (their D1) and the E9 (their D2: cartomizers and batteries), as does NHaler (simply KR808D-1 and E9). They are the only moderately-priced suppliers I know of, although the cartomizers are priced competitively with GreenCig carts (and I’ve read good things about Vapure’s.). No. Confusingly enough, the fittings for these two are not compatible. This is a question for the webmasterhere.Can I use part of the information from your post above if I give a backlink to your site? 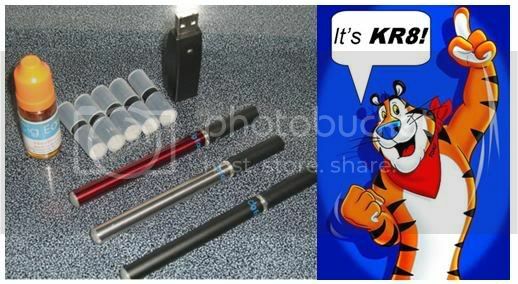 Even though I think this is a ploy to promote e-cig brands we don’t recommend here … the answer to your question is: yes. If you use that (in some way I have not yet figured out) to spam our readers, that permission will be revoked.